Mike Miller | Allen Benjamin Tree Care Inc.
We recently completed a large job providing storm damage tree removal in Bay City Michigan. The homeowner had a large number of trees knocked down onto fences and high voltage power lines after a recent storm. The electrical company restrung the wires however the homeowner was left with a large mess and dangerous trees and limbs on their property. Our Bay City tree service arrived quickly to help this homeowner get their property and life back to normal. We provide ourselves on providing quick response times, exceptional service and fair pricing. If you need a tree service company in Bay City MI that you can trust to do the job right, please contact us at (989) 893-8688.
damage. Heavy snow and ice can weigh down branches and low-hanging limbs causing them to fall onto your home, business, or vehicle. 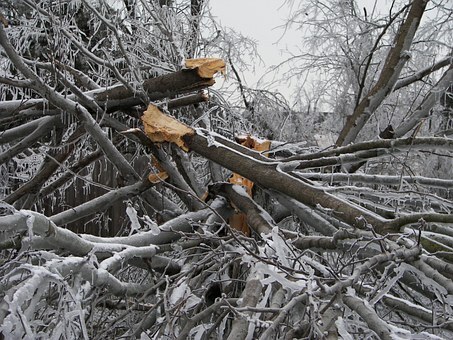 If limbs and branches can cause property damage, then imagine what a fallen tree can do. Damage can range from a cracked windshield or minor roof damage all the way to displacement from your home, business or vehicle. Branches and trees falling can even potentially pose a threat to people nearby. AB Tree Care can identify trees that are dead, decaying and structurally unsound, remove them from your property, and grind up the stump. In addition, we can trim the branches and limbs of the healthy trees leaving your property armed against the coming snow and ice. By calling us to take care of all your Saginaw tree services, your property will be significantly less likely to incur damage from heavy snow and ice this winter. For Saginaw Tree Services contact our office at (989) 777-8001 or our Bay City office at (989) 893-8688. November is an excellent time to schedule your annual tree trimming service in Saginaw. The winter weather will soon be here and often those colder temperatures can cause already weak limbs and branches to come down on their own. A tree trimming service can be a smart, preemptive move to protect your property. 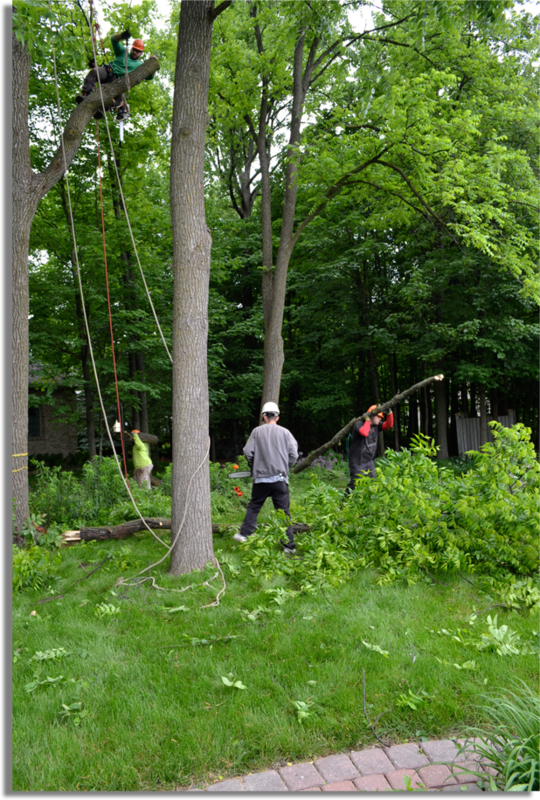 Recently, Allen Benjamin Tree Care Inc. has been committed to the abundance of tree removal projects in Bay City and Saginaw. With storms and strong winds, Mother Nature brings down trees and branches. Allen Benjamin Tree Care is here to help and will promptly provide our tree services to anyone within a reasonable radius of Saginaw and Bay City. Once the tree removal is complete on your property, AB Tree Care also offers stump grinding services and tree maintenance, in order to keep your yard healthy and lush. Please contact us for more information and pricing on our tree service in Saginaw, Bay City and all the surrounding areas. Allen Benjamin Tree Care Inc. recently completed a tree service at a home located in Frankenmuth, Michigan. The job entailed tree removal, tree trimming, stump grinding, & pruning trees from a backyard. Owner, Mike Miller, and his 4 man crew completed the job in 5 hours, removing approximately 5 trees in that time. The home owners wanted to clear these trees to provide more space and sunlight and when Mike & Crew started the job the yard was overgrown and in need of some pruning & trimming. The yard looked better than ever when Allen Benjamin Tree Care Inc. was done, the clean up job was completed within the 5 hours, as well, to the home owners complete satisfaction. Contact us today if you have a backyard that is overgrown with trees & stumps that need to be removed, trimmed, pruned and more. Welcome to the new website for Allen Benjamin Tree Care Inc. We hope you have found the information you are seeking regarding our tree care and removal services in Mid-Michigan. Since 1999, we have proudly served residential and commercial customers across our area. As you will see on the pages on this site and our photo gallery, we work to the highest standards of safety on every work site and our team has the experience, knowledge and training to complete your job. We will be using this blog to post information about our latest projects, events we participate in, industry news and more. Please check back often for updates and do not hesitate to contact us with any questions.